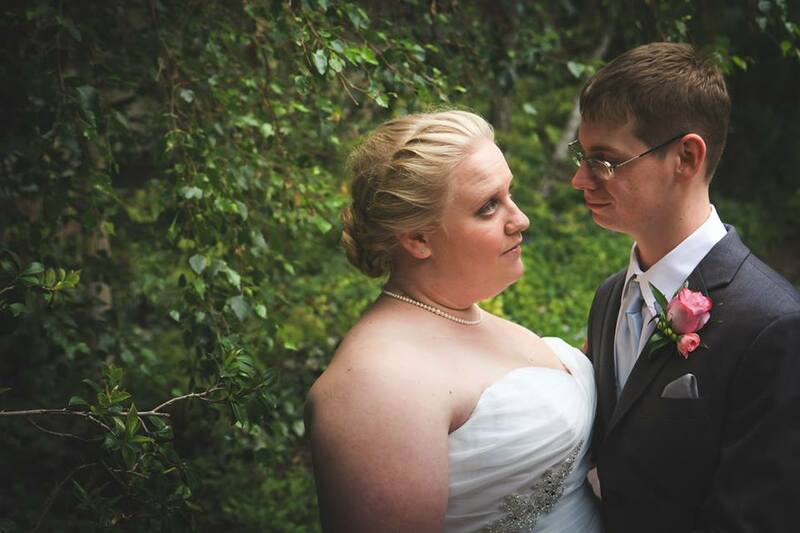 When I first saw Claire and Jon’s wedding photos, I practically begged her to let me feature them. 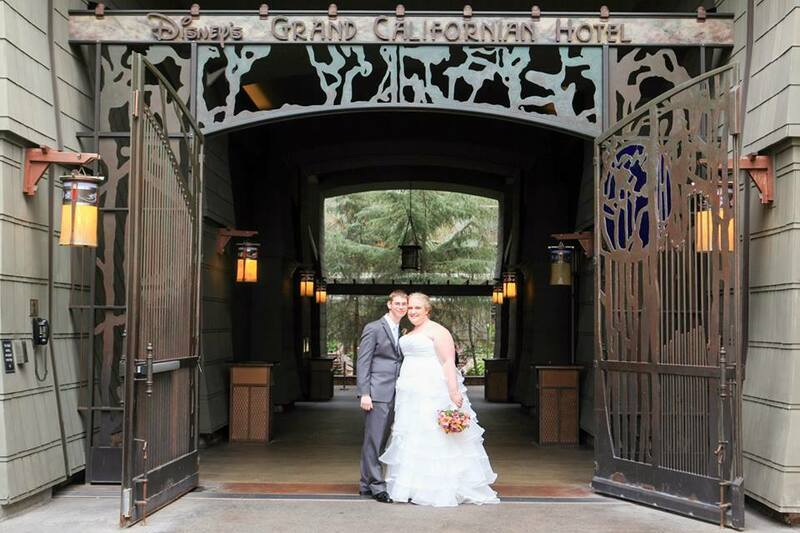 Nearly a year after their wedding, I’m finally getting around to sharing their Escape wedding at Disney’s Grand Californian Hotel! 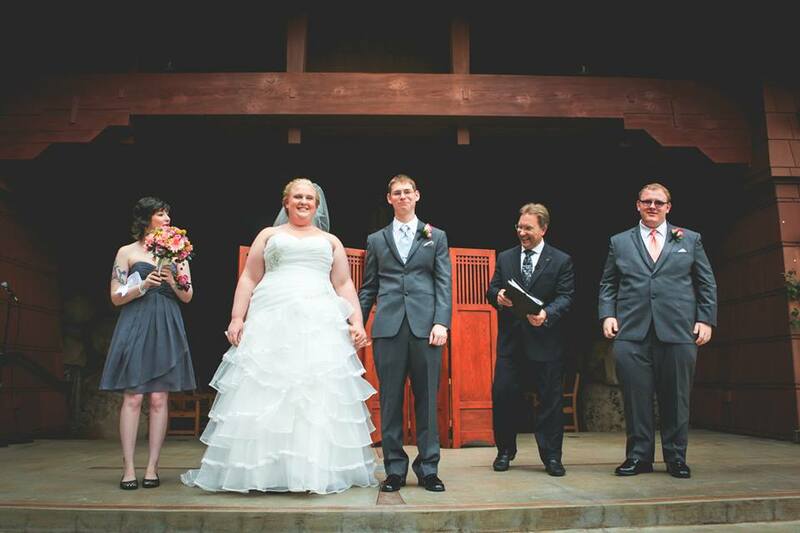 Claire and Jon’s wedding is a perfect textbook example of how elegant and fun an Escape wedding at Disneyland can be. Claire and Jon hardly did any upgrades to their package, keeping their costs with Disney very close to the $5000 minimum, and when you look through the pictures you’ll see those upgrades are so totally not necessary for a beautiful celebration … so if you’re currently planning an Escape wedding and are on the fence about how much to spend, I hope this wedding will put you at ease! 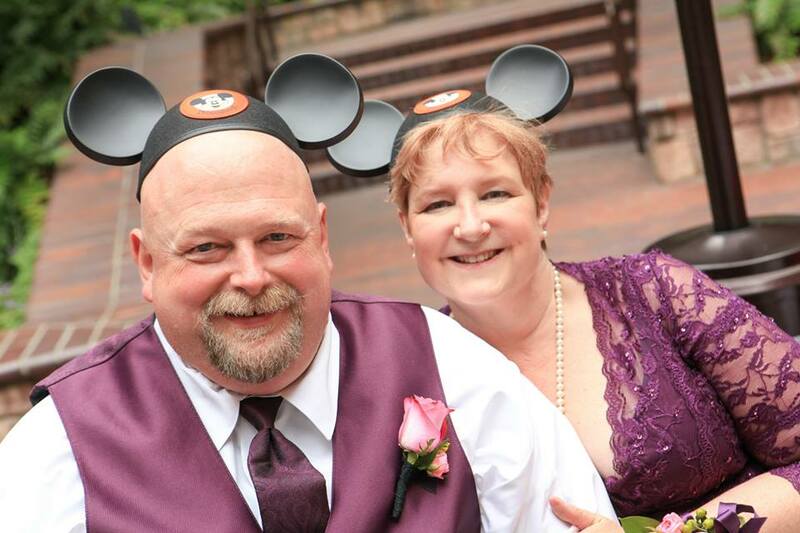 Claire and Jon were not as worried about themselves as they were focused on making sure their guests were enjoying themselves (and how could you not, when you’re surprised with your very own pair of personalized Mickey ears). 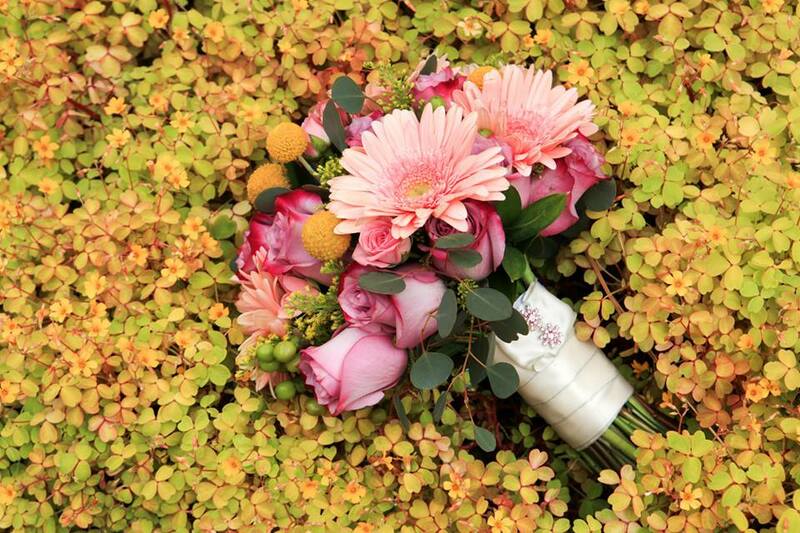 One fabulous cost-saving move seen here is a wrist corsage for Claire’s bridesmaid instead of a bouquet. That probably saved them around $100! That’s some brilliant budgeting. 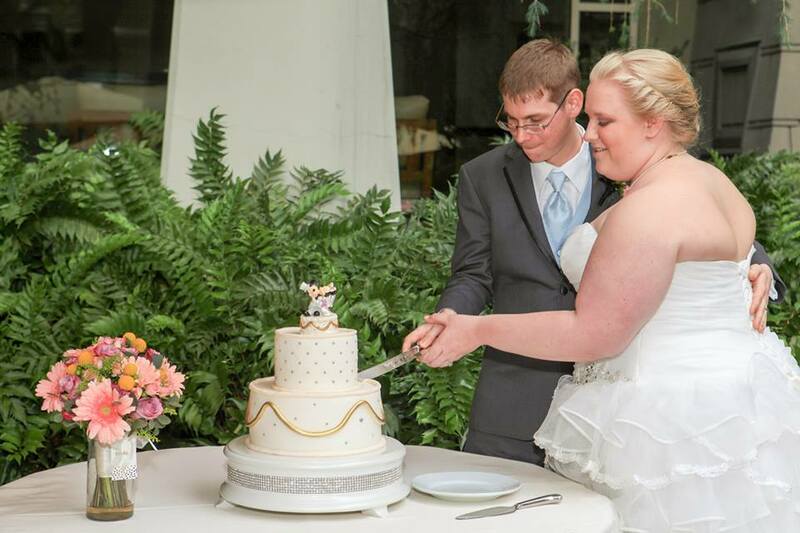 I hope you enjoy reading about their big day from Claire’s perspective, and enjoy the photos from George Street Photo & Video! My dad actually suggested it! We had gotten engaged after watching World of Color for the first time so obviously we love Disney. Wedding planning was on hold for a while when my parents finally asked us, “Is this happening or what?” I had been stubborn and wanted to pay for everything myself but life kept happening and getting in the way, so plans kept getting delayed. So my parents said they would take care of the base cost for a Disneyland Escape wedding. We agreed as long as we were able to pay for everything else, that way we still felt like we had control over some of the decision making. Some people were a little judgey about it. 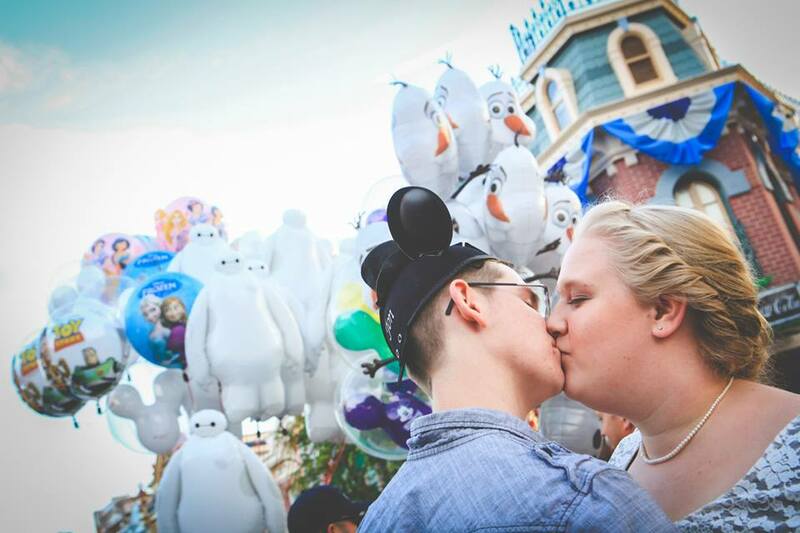 When people hear “Disney wedding” they think of a grand, million dollar event, or something childish or spoiled. But when I assured people that, “No, Mickey is not marrying us” and it was going to be cheaper then something in the Seattle area, they seemed to warm up to it. And they would be getting a Disneyland vacation out of it, too! 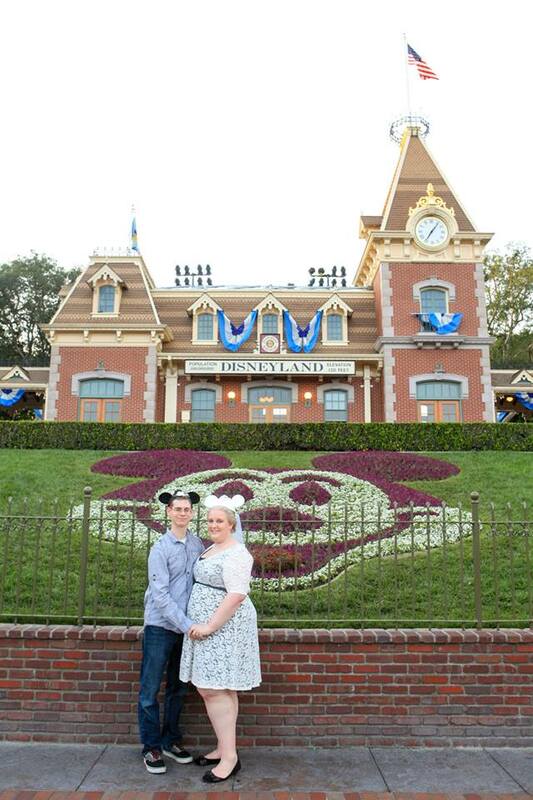 A couple months after our wedding, we threw a reception in our hometown for everyone who couldn’t make it to Disneyland (or who couldn’t be invited due to budget). We actually didn’t have much of a theme. I wanted it to look clean and classic, with very little hints of Disney but I didn’t want Disney to be the overwhelming theme. We were already in the heart of it, so I didn’t think I needed to add more. 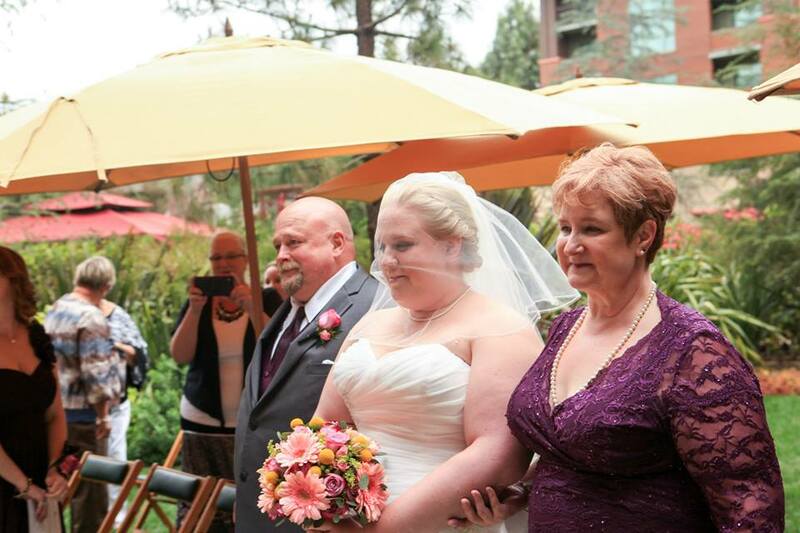 What was your biggest challenge in planning your Disneyland wedding? I was worried how I was going to get the elements I wanted in my wedding from Seattle down to Anaheim without breaking or ruining anything. 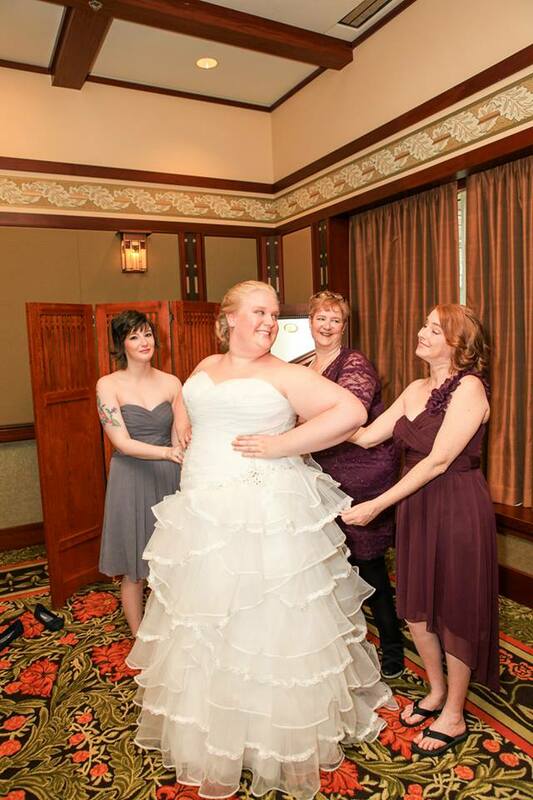 For the dress itself, I carried it onto the plane and we were even allowed to board first and put it in its own overhead compartment! For the centerpieces and little things we wanted to add, we stopped at the nearest Walmart after landing in Anaheim to pick them up a couple days before the big day itself. Because we bought a lot of things last minute, there were a handful of things that we forgot (like bubbles for the guests to blow during the recessional) but the day was perfect regardless. Prior to the ceremony, while guests were finding their seats, we played recordings of classical Disney love songs on the piano. We also had a guest book that was Alice in Wonderland themed. A little bit of both traditional and unique. For place cards we used Mickey ear hats with the guests’ names embroidered on them! These made for super cute pictures and everyone would have ears to wear into the park afterward, plus a nice souvenir of their trip. We did the traditional dances, such as first dance and parent dances. On the invites we had asked people what songs make them dance, so we had made sure to get everyone up and dancing at one point or another. We splurged on my dress, big time. It was an Alfred Angelo Tiana gown that I fell in love with. Otherwise we tried saving money everywhere that we could. We used an iPod in place of a DJ, didn’t purchase any decor upgrades, and went with a corsage for my bridesmaid instead of a bouquet (MUCH less money). We didn’t have any extra decorations that weren’t either free or purchased ourselves in advance. We were partying on a very tight budget! Seeing Jon at the end of the aisle. We had both been so nervous and anxious, texting throughout the morning and sending each other little notes a couple hours before the ceremony. But finally seeing him all the nerves melted away and all I could feel was joy and love. I would splurge a little bit more on decor. It would have been nice to have a few flower arrangements here and there, especially some petals on the aisle. 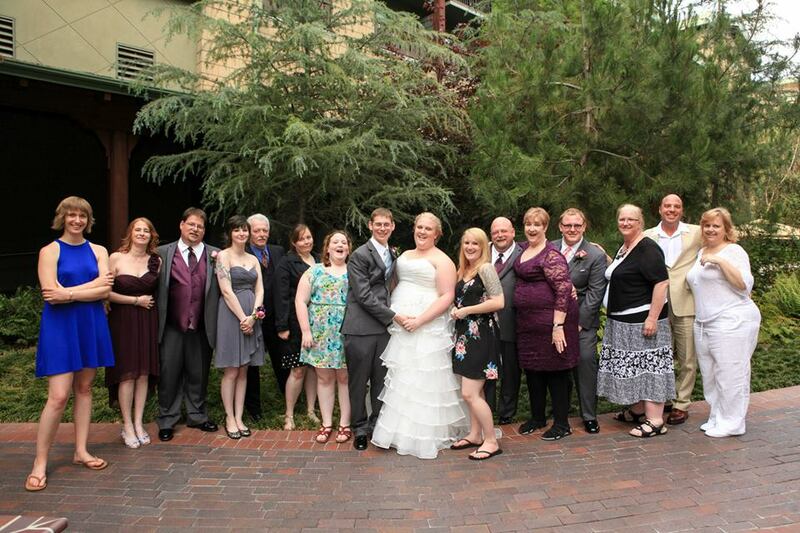 I also would have taken a break between the reception and going into Disneyland for pictures. We wanted pictures inside Disneyland while it was still light out, but we were exhausted and it showed in the pictures we took in the park. Enjoy. This is supposed to be fun. A lot of curve balls are going to be thrown at you, and a lot of things are NOT going to go the way you planned. But you have to learn to roll with it. 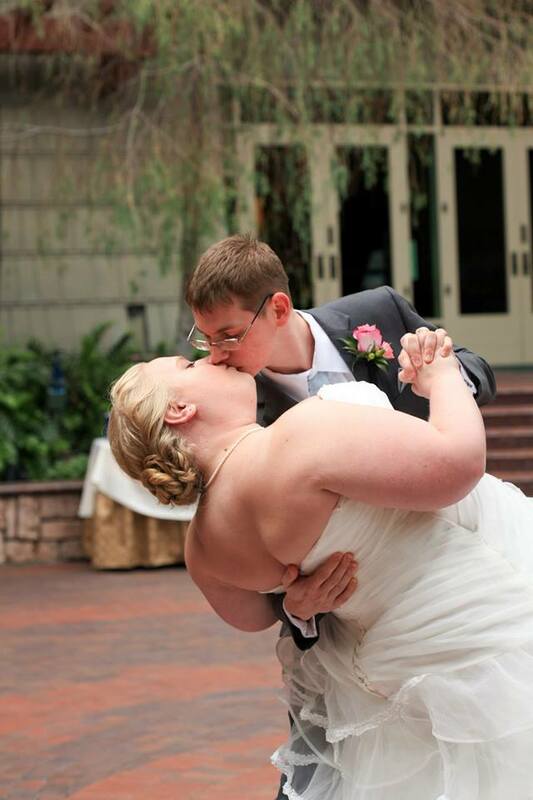 As long as you marry your best friend at the end of the day, then it was a good day. After our reception was over at the Brisa Courtyard, we changed into “park appropriate” attire and went into the park to take even more pictures. 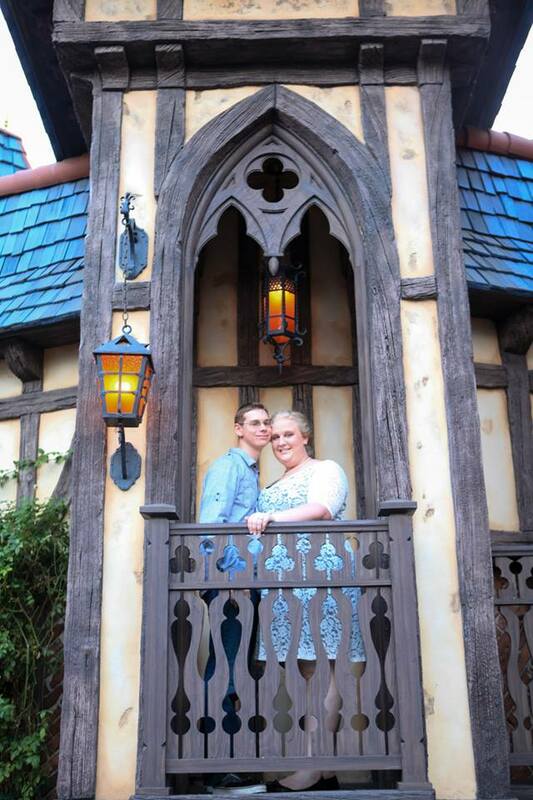 However, we ended up cutting our in-park shoot short because we were so exhausted by the end of the day. We both fell asleep before our heads even hit the pillow that night!